The RYA Youth National Championships kicked off today with racing for all classes at the Weymouth and Portland National Sailing Academy. The day started with a short postponement ashore before sailors headed out for their first race around 1100. The light sea breeze remained in the harbour for the rest of the day. A dying and unstable breeze in Weymouth Bay meant that the schedule was not completed on the 420, Spitfire and Radial boys’ courses. Consistency was key across the race courses, and those who mastered the shifty sea breeze have taken the advantage on day 1. A hat-trick of firsts started Dan Wilson’s Youth National Championship title chase with a bang. The RS:X sailor led from the start of each race and protected his lead around the course. Younger sister, Emma Wilson and Emily Hall sit on ten points in second and third respectively, both scored a second, third and fifth however Wilson pips Hall on count back. Favourites coming into the Youth Nationals, Dan Venables and Patrick Keech proved their dominance in the 29er class picking up double wins in racing today. In the 29er yellow fleet Bobby Hewitt and Harvey Martin also had an excellent opening day, picking up a win in the first followed by a second. 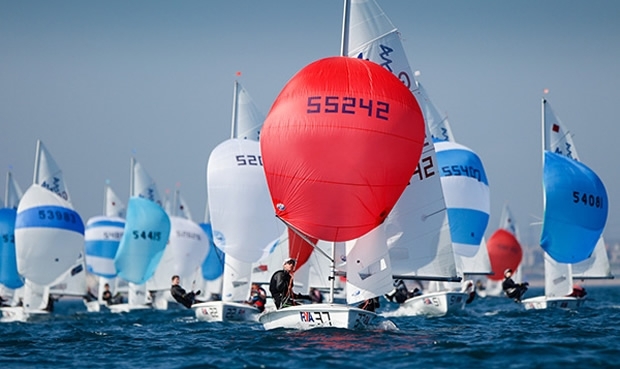 The 15-year-olds, who transitioned into the 29er this year and are the 2014 RS Feva World and European Champions, were thrilled with their first day. “It’s been a really good day, we were leading from the start in the first race and we just played the shifts up the beat and it was easy from there,” said a smiley Martin. Winning the second yellow fleet race of the day were all girl team Hannah Bristow and Emily Covell. Bristow, also a previous RS Feva World Champion, paired up with Covell a year ago and they have spent the winter training in the 29er Transition Squad. Henry Wetherell and Michael Beckett took all three of the race wins today. Wetherell claims the advantage with double firsts and a third finishing the day on five points to Beckett’s six. The Laser Radial boys’ fleet only managed to finish two of their scheduled three races. Jack Cookson and Daniel Whiteley stole the show in the two races sailed, both with a one and two to their score lines. Both were pleased with their results: “My first day was really good, quite consistent and I was pretty quick around the race course.” Said Whiteley. After disappointing starts to both races, Cookson used his downwind speed to the advantage and sailed back through the fleet, pipping Whiteley to take line honours in the last race of the day. Light wind specialist, Karyna Manuel ends the day in pole position in the Laser Radial girls’ fleet. Similar to other race courses, consistency was the name of the game for the Radial girls’ and Manuel takes the early lead with a six point advantage over rival Hanna Brant. Other race winners of the day, Clementine Thompson and Ellie Cumpsty sit further down the pack after both picking up a starting penalty. Max Clapp and Ross Banham won the first and only race on the 420 course. The pair led up the first beat after a successful start, however they lost their lead to Martin Wrigley and Marcus Tressler after sailing to the wrong mark. With impressive boat speed Clapp and Banham regained the advantage up the second beat and held until the finish, winning by only a couple of boat lengths to Wrigley and Tressler. The Spitfire class also only had one race today. Eddie Bridle and James King took advantage of the tricky sea breeze conditions and crossed the line ahead of Sam Barker and Victoria Akhurst in second. Alex Philpott and Jess D’Arcy completed the podium in third.